Chris Hewett is a partner at Nooney and Roberts and recently celebrated ten years with the firm. He devotes his practice to representing and protecting the rights of people injured by the negligence of others. Through hard work and dedication, he has recovered over $35 million on behalf of his clients. His extensive experience in settlement negotiations, both before and during litigation, makes him uniquely qualified to maximize the financial recovery for each of his clients. Chris obtained his Bachelor’s Degree from the University of Georgia, and his Juris Doctor from Florida Coastal School of Law. 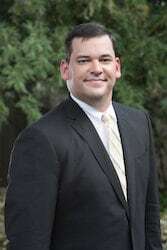 While still in law school, and prior to working for Nooney and Roberts, he was fortunate to gain valuable experience working for a small personal injury law firm. During that time, Chris developed valuable skills necessary to effectively advocate on behalf of injured clients. In his spare time, Chris enjoys spending time with his wife and two children. He also enjoys reading, sports, and spending time outdoors.